Facts of Kuvasz Dog, "Scientific name for Kuvasz Dog, or domestic canine, is Canis lupus familiaris". The fear of a dog Cynophobia.The Kuvasz Dog is one of the oldest breeds of dogs originating from Hungary, which has a history of complex character as well as regal bearing. The Kuvasz Dog are fearless dogs with their heads being the most beautiful part of the Kuvasz. The Kuvasz Dog move like wolves with their great, powerful and graceful strides. Whenever it trots or runs, Kuvasz Dog looks like he is gliding with small up-and-down body movements. In fact, Kuvasz Dog can trot up to 15 miles because his gait is effortless. The Kuvasz Dog is a loyal companion who is ever wonderful and patient but not everyone can please Kuvasz. The Kuvasz Dog is reserved with strangers, aloof, independent and courageous because he was bred as a guard dog. The Kuvasz Dog is ever alert and can sense any kind of danger before you can even suspect the looming danger. The Kuvasz Dog are very hard to train because of their independent nature. Nonetheless, the Kuvasz Dog are intelligent breeds who are extremely active and therefore they can’t make as good apartment dogs. The Kuvasz Dog appearance is attractive because of his black nose, almond-shaped eyes and dense white coat. They are muscular and sturdy with great endurance but still maintaining their unparalleled elegance. The average height of the male Kuvasz Dog to the shoulders is 28 to 30 inches (71 to 76.2 cm) and the average height of the female is 26 to 28 inches (66 to 71 cm). The average weight of the male is 70 to 115 pounds (31.7 to 52 kg) and the average weight of the female is 70 to 95 pounds (31.7 to 43 kg). The Kuvasz Dog proportionate muzzle is marked by a well-defined stop with nose featured by large nostrils. Its v-shaped, thick and black ears are slightly rounded at the tip. The Kuvasz’s dark brown almond-shaped eyes are widely set. Kuvasz Dogs sweat glands are between their paw pads. A Kuvasz Dog sees in color and have better low light vision. Kuvasz Dogs have three eyelids, a lower lid, an upper eyelid lid and a third lid, that is called a haw or nictitating membrane, this keeps the dogs eye protected and moist. Kuvasz Dogs eyes have a special membrane for seeing better at night, called a tapetum lucidum - a dogs reflective layer in the choroid chiefly of nocturnal, causing the eyes to glow when light at night hits the eyes and they consist of some layers of smooth flat cells covered by a section of double deformed crystals. The Kuvasz Dog has a medium-boned body with neck masked by mane that reaches the chest. Its docked tail stays low and it slightly reaches at the hocks. The dewclaws on front legs are usually removed but those on the hind legs aren’t. The feet are well-padded with body cascaded by medium-length fur coming in white and ivory colors. 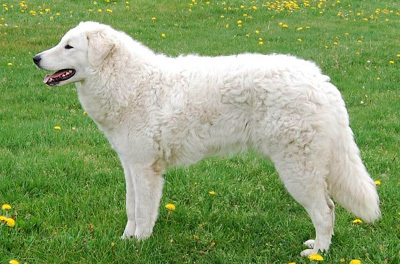 The Kuvasz Dog has a double coat, which is heavily pigmented and can be either wavy or straight. Its undercoat is usually thick. The Kuvasz Dog is generally a tough breed but he is prone to elbow and hip dysplasia alongside other ailments such as gastric torsion and osteochondritis dissecans. With his thick coat, this dog needs regular grooming. The Kuvasz Dog shouldn’t be bathed because his hair shades off naturally and remember to check the ears frequently for matting. If purchasing a Kuvasz Dog from a breeder, make sure to find a good breeder with references check at least two to three of the puppies that were purchased from this breeder. The Kuvasz Dog belongs to the Working Group and in 1931 was recognized (AKC) American Kennel Club. The number one heath problems amongst Kuvasz Dogs is obesity, so always make sure your Kuvasz Dog doesn't get to fat. Many foot problems that Kuvasz Dogs have are just an issue of long toenails. A Kuvasz Dogs can hear a sound at four times the distance of a human. Sound frequency is measured in Hertz (Hz) Def-Hertz is the measurement of frequency, explicitly it's one cycle per second. The higher the Hertz are, the higher the pitched the sound is. Dogs hear best at 45,000 Hz to 65,000 Hz, while humans hear best at around 20 Hz to 20,000 Hz. Only humans and Dogs have prostates, But a dog doesn't have an appendix. Kuvasz Dogs have two times the amount of ear muscles than people. A Kuvasz Dog’s mouth can apply approximately 150 to 200 pounds of pressure per square inch and an American Pit Bull Terrier, German Shepherd Dog and a rottweiler can have 320 LBS of pressure on avg. Kuvasz Dog’s nose prints can be used to identify them, their nose prints are like a humans finger print. A dog smells more than 1,000 times stronger than that of a human. A Kuvasz Dog’s nose, secretes a thin layer of mucous that helps it absorb scent, after that they lick their noses and sample the scent through their mouth. A Kuvasz Dog is an omnivore, (definition-they eat both other animals and plants).